Lemon Garlic: Turkey breast, evaporate cane syrup, low sodium gluten free soy sauce, lemon juice, garlic, black pepper, celery juice powder. Basil Citrus: Turkey breast, evaporate cane syrup, water, apple juice, lemon juice, sea salt, honey, spices, lemon pepper, onion powder, garlic powder, celery juice powder. The first I taste is a strong sweet with a touch of tanginess. The garlic comes in soon after and comes on strong. The chewing reveals a bit more garlic intensity, along with some natural turkey meat flavor. There's a bit of black pepper going on in the background. Considering it's marketed as "Lemon Garlic", it's tends to to hold well, mostly with the garlic portion. The garlic is noticeable right away, and builds strength, almost to the point of feeling its pungent burn on the tongue. Yet, the stronger sweetness tends to dull its effects, allowing you to get the full garlic experience in a more palatable way. 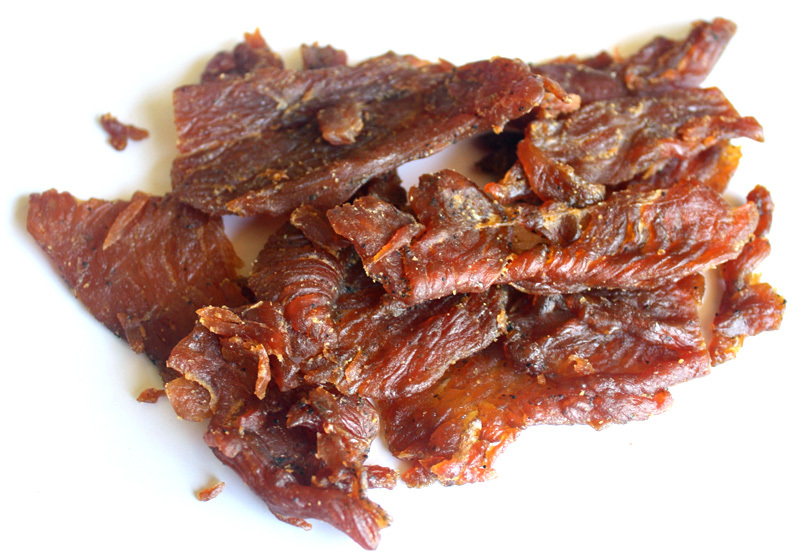 Otherwise, the flavors that tend to define this jerky is mostly the heavy sweet and garlic. The black pepper is light and remains in the background. The natural turkey meat flavors are next-most noticeable. The Lemon remains weak in this jerky, and perhaps creates that initial tanginess, but that's about it. The first flavor to hit the palate is a fair amount of sweet. The basil comes in really quick, however, and soon overtakes the taste buds. The saltiness is next in a light amount, and as the chewing gets underway, the natural turkey meat flavors show up. I can pick up the citrus in a very light amount. There is also a light black pepper that comes in late. For being marketed as "Basil Citrus", it's definitely strong on the basil part, but light on the citrus part. I can identify the lemony citrus character, but it remains subtle, being overtaken by the stronger basil, along with the stronger sweet. The basil is very front and center, gives out a well-defined, clear flavor. 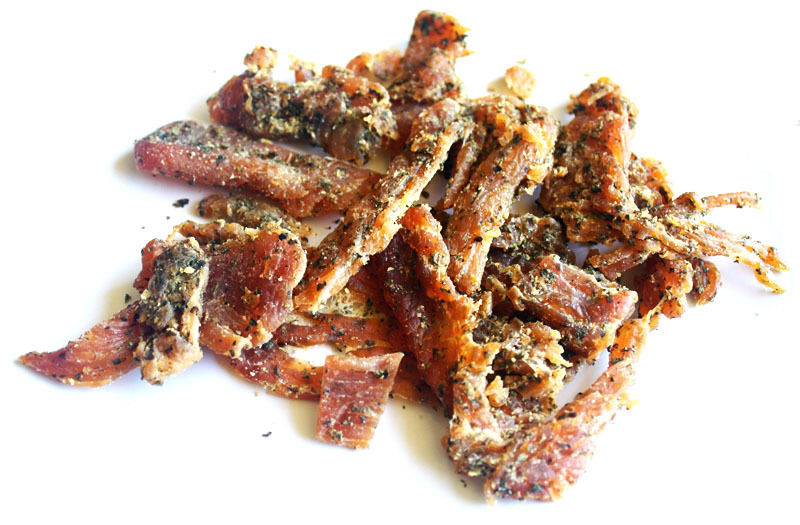 Otherwise, the flavors that define this jerky is largely the basil and sweet. There's a light black pepper in the background, and lighter amounts of natural turkey meat flavor. The lemon citrus remains light, while the saltiness is in a moderate intensity. Both the Lemon Garlic and Basil Citrus are tender and moist to chew. Perhaps the Lemon Garlic is a touch more chewy, though a little more cleaner to handle. Both give out a mushy chewing texture, but otherwise no stringiness or other unchewable tissues. It's all very meaty. Verdict: Both turned out to be very enjoyable, but I'd have to give the edge to Basil Citrus, only because it lived up to its name better than the Lemon Garlic. Even though the Basil Citrus was light on the citrus, it still showed up better than the lemon in the Lemon Garlic. The lemon in the Lemon Garlic is almost non-existent. However, I love garlic, and so I really liked the Lemon Garlic anyway. 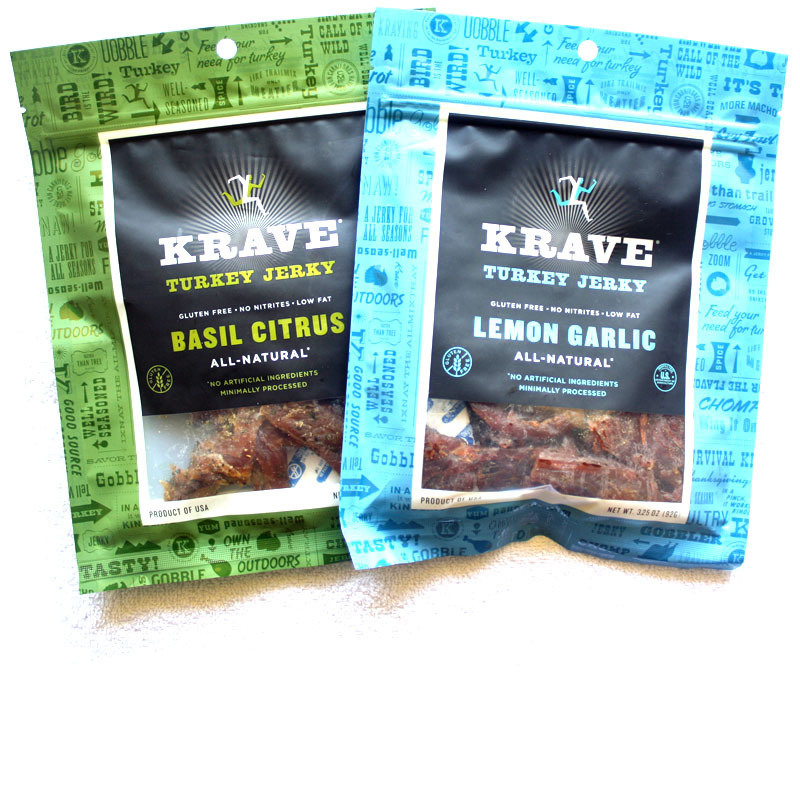 But the Basil Citrus made a for a great tasting jerky. Basil Citrus gets a Best rating, Lemon Garlic gets good. Both still average out to Best.